It's finally time to start this... I've been wanting to make this game for so many years and now I'm free to give it my all! Battle Gem Ponies is the name of the game and it's about making little super-powered horses with gemstones on their chests fight each other for sport. I plan on releasing it before I graduate college in Spring 2016 and having it available on Mobile and PC platforms for $4.99. This is the dream game I've wanted to make for years. The success of this game will determine if I'm cut-out for a career in indie game development so I'll be putting everything I've got into making it the most awesome game it can be. Get a full description of the game and a bunch of details below. 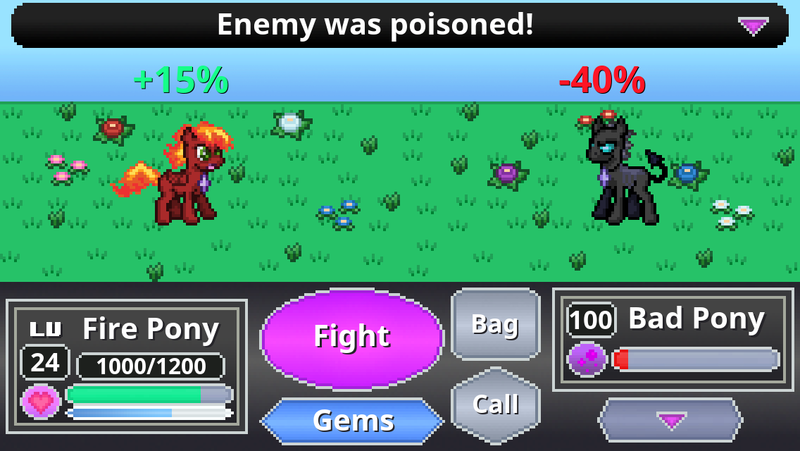 Battle Gem Ponies is a competitive turn-based RPG adventure about little super-powered ponies with gemstones on their chests that like to fight each other for sport. When partnered with a trainer, a pony has the combat advantage of switching between three distinct forms of the trainer's choosing. Embark on a journey to become the strongest pony trainer in the world and overcome challenges along the way. Players can also participate in a variety of multiplayer modes both online and offline using either a team developed in the single player mode or by selecting and customizing a team from a list of available ponies. It's been a long time coming. I've dreamed of making a game like Pokemon ever since I first learned to code. 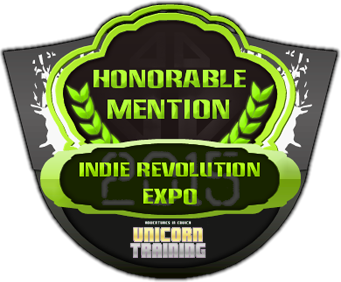 Now I''m a developer with multiple finished titles under my belt and the know-how to make my own IP and sell it on digital stores to be played via Android, iOS, Steam, Desura, PSVita, Ouya, and possibly 3DS. With as much free time as I give myself I should have this game done within 18 months. This game is beginning just in time for my Mobile Game Design course. I'm in the Gaming & Simulation program at the Pennsylvania College of Technology and in the Mobile course each student has to go through the process of making a functional mobile game. Since I've already done that 6 times I want to try to make something huge for once and have it out by next Christmas. I'm currently in the planning stages of making Battle Gem Ponies and it will be my biggest game by far. Development-wise, and hopefully sales-wise so I can make a career out of bringing quality games to the mobile space. Unicorn Training mock-up vs final screenshot. Remember that the header image is just a vague mock-up of what the game will look like later. Nothing has been coded yet, the screen layout is not final, and I still haven't settled on an art style for the backgrounds. Do I want them blurry like in Pokemon or detailed like I've seen in fangames? Should they be animated? Should there be a layer of animated things on the still image? All of these are things to figure out as the project comes together. What I have right now is a collection of rough drafts and written ideas. 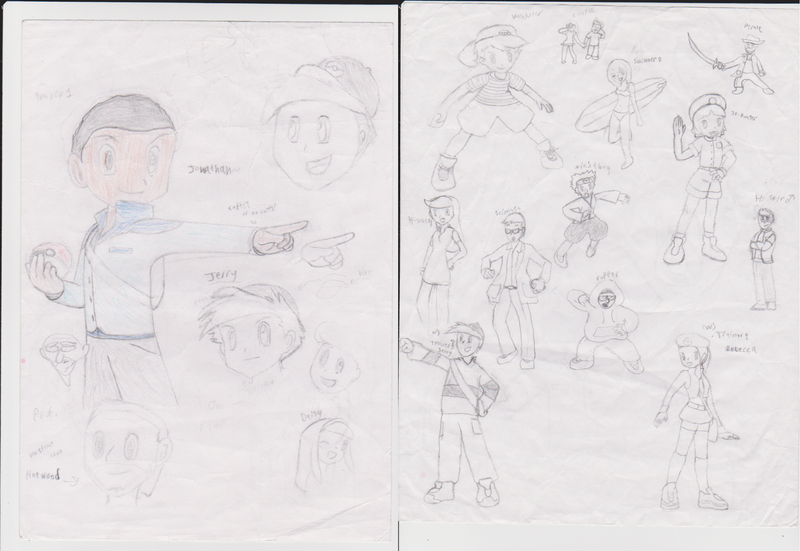 I also have a folder containing all the stuff for the Pokemon game I made in high school. In addition to nostalgia, it gives me a starting point. I get to feel what the younger me felt and make wiser choices as a more experienced developer. started crossing off unnecessary features. 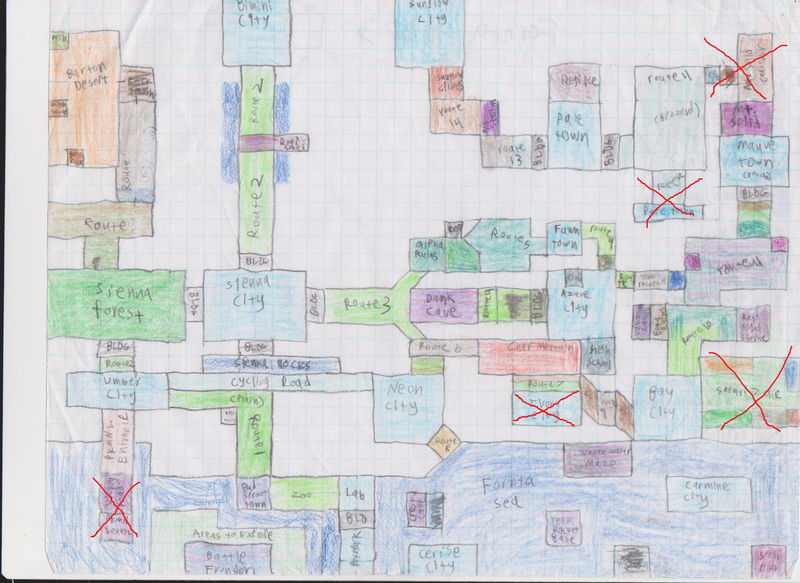 This map, for example, was going to be my Pokemon fangame's region. Color themed cities, numbered routes to each gym, places for legendaries to hide, and a colorful variety of landscapes. With some tweaking I can still use this for Battle Gem Ponies. I just need to go over exactly how I want the game to progress and cut out the filler to save development time and game memory usage. There is a 50MB limit on games without having to make separate downloadable packages. I also don't want people turning down my game because there's no room on their phone. My DBZ RPG from 12th grade. That Pokemon game isn't the only game I can pull from either. The assets from my other mobile games (Unicorn Training in particular). I still use edited versions of menu sprites from my other high school fangame Dragon Ball Z Brawl in everything. I can also remember how I coded the RPG layout and turn based combat system, so doing it again in Unity will be easy (and much more efficient). I can copy a lot of complex RPG code from Unicorn Training too and take the chance to improve on things behind the scenes. Battle Gem Ponies has 2 playable characters. Each one's storyline is about as different as 2 different Pokemon versions released simultaneously. Picture Pokemon Omega Ruby and Alpha Sapphire, now what if instead of buying both versions to see both stories unfold you just play as the opposite gender and get a different playthrough? After that idea came to me I started writing ways to make playing for a second time different enough to be worthwhile. One of my design goals is infinite replayability so the game will have to be long, interesting, fun to playthrough at least twice in a row, and have a deep online multiplayer battling system. Inspired by the Pokemon Emerald art style (but with more vibrant colors). amount of time. That means a bigger world and more NPCs. The art style allows me to be less detailed with the stuff in the background and put more emphasis on what I do want players to see, ponies in combat! This is also my chance to use a more tilted top-down perspective than I used in Unicorn Training. Even the Gameboy Advance Pokemon games didn't have characters and objects in the overworld tilted the way I wanted so I made sure to adjust hairlines and lower heads when making my sprites. Since I'm going for a Gameboy Advance look, the Pokemon Emerald sprites were used as reference. I stare at those so I can see how the pixels line up to make everything look just right. By drawing my sprites next to the originals I can see the details I'd spend minutes looking for when drawing on my own. I also always liked the design of Brendan's sprite in the games. I think a spikey head looks cooler than the trainer cap other Pokemon heroes wear. I also wanted the girl to look a little rough and tumble while the boy looks fresh and clean for story reasons (more on that later). From these sprites I can make templates for all NPCs and animate them in any way I want. Lots of mock-ups and sprite creations. Coming up with a landscape layout that works was a bit of a challenge since I originally planned for this to be a portrait only game. I really liked the idea of having a deep RPG on your phone that you can play passively with one hand while you do other stuff. I also wanted people to be able to make Let's Plays of it and have a widescreen version to display at events like BronyCon or my school's BYOC. Now I've settled on making it toggle between Portrait and Landscape at the player's will. Lots of mock-ups and borrowed sprites from Unicorn Training. I also designed the game's logo here. The portrait version of the interface was the very first thing I made a mock-up of. The idea is to have the camera slide back and forth between ponies to follow attacks, allow players to see all the info they need, and keep all the options they can touch along the bottom where the thumb could rest. I want to get the overworld to fit nicely in portrait too. A nice big D-Pad, action button, and access to a menu button. Having all the battle info easy to reach mid-combat is important too. I'll have more details on how it works once things are more concrete. These are trainer sprites I made in high school. inspired by a fan-made sprite of Brendan from Pokemon Ruby. Trainer sketches from 2010. I never drew anime styled humans before. I had to redesign my protagonists from scratch because the ones I made before just look silly to me. I still like the aesthetic of a black male trainer though. A bit of self-insertion? Or maybe it's a refreshing change to see a character that looks a bit like me. I scrapped the idea of a cast of 4 and made it a binary choice of boy or girl. I wanted just two solid, memorable designs. I ended up giving the boy spikey hair and making the girl's hair red and dress green for contrast. Like early Nintendo, I think the game sprite should come before the cartoon drawings. The game sprite will dictate what the final design will be since that is what players will see most and grow an emotional attachment to. If you make the tiny sprite stand out, the character will have a good silhouette. With a good silhouette you'll have a memorable character that players recognize instantly whenever they see it or anything like it. With the protagonist designs ready to go (at least in overworld sprite form) the pony designs themselves were next. I looked at a bunch of pony sprites from the internet as well as a template from Unicorn Training to get the angle and size just right. I also took note of the shading technique used ion Andromi sprites to give my pony some detail. I knew from the start that I wanted a pony used by the bad guys to look like a mix between a Changeling, Poochyena, and Houndoom so I found sprites of a changeling and a Ponyta/Houndoom fusion for reference. The result was a starter pony for me to base others on. A normal template won't do me much good because each pony will have mostly unique poses and animations. To make things easier on myself I'll be making a spritesheet full of pony body parts in multiple poses so I have a starting point for everything I could imagine. I considered making the battle scene with static sprites the way GBA Pokemon games did because it would be easier. I didn't go through with that because I'm fine with my game taking an extra 6 months or so to come out with fully animated action packed battles. One of my gripes with older Pokemon games is how boring they are to watch. The 3D ones are visually interesting because things are moving, everything feels alive, and I can marvel at the beautiful art style while I'm not making choices. You should know I won't be going completely alone on this game development quest. A few months back I requested the help of Justin Heng and Miles Fogle. Two electronic musicians who have proved to me that they can both work efficiently and produce just the right sound based on my requests. So expect a soundtrack to release alongside the game. So this is the beginning of Battle Gem Ponies... I hope you're as excited to play it as I am to make it. This is going to be a community driven game so I'll need lots of feedback. There will be multiple pre-alpha, alpha, and beta tests all throughout development so check back here for updates every Tuesday and Friday. I don't just feel like this game is going to be awesome, I know it will be.